Analysis of Young San Diego Craft Beer Drinkers’ Craft Beer Consumption in Relation to Total Beer Consumption: The Role of Knowledge, Awareness and Drinking Motivations. I would like to thank Dr. George E. Belch, Professor of Marketing and Chair of the Marketing Department at San Diego State University for allowing me to do an independent study under the supervision of a marketing professor for class credit towards earning my degree. I would like to thank Dr. Andrew Baker, Marketing Professor at San Diego State University, for taking the time and effort to help guide me through the research process and supervise my progress throughout the semester. I would also like to thank my fellow San Diego State University Marketing Students that were in Dr. Andrew Baker’s Spring 2014 Marketing Research course for both helping design the survey as well as gather the responses that I have analyzed. Without any of the above mentioned I would not have been able to undertake this research project. The craft beer industry has seen rapid growth in the last decade and is continuing to expand and acquire market share from large macro breweries. I will investigate the relationship between someone’s total beer consumption that is craft beer, total beer spending that is spent on craft beer, as well as the difference in price someone is willing to pay between craft beer and domestic beer. I test to see whether a consumer’s knowledge level, awareness of breweries, beer tourism level, and drinking motivations have an effect on their craft beer as a function of total beer consumption and spending. I use data compiled from a craft beer survey created by San Diego State University marketing students in the spring of 2014. When it comes to craft beer consumed compared to total beer consumed percentage as well as the price premium between craft beer and domestic beer, my findings suggest that the most significant variable is craft brewery awareness level. My findings suggest that the most important factor affecting craft beer spending compared to total beer spending percentage is whether or not someone prefers the alcohol aspect of beer, followed by whether or not they enjoy the craftsmanship aspect of craft beer, both of which have a negative effect. While I anticipated preference for alcohol as a drinking motivation to negatively influence the dependent variables, the influence of valuing the craftsmanship aspect of craft beer was very surprising. Other variables that have an effect on craft beer compared to total beer consumption, spending, and price premium are objective knowledge and subjective knowledge. My findings highlight the importance of raising awareness of craft breweries and knowledge level of craft beer consumers. The results also make the case that high alcohol content and the craftsmanship that go into making craft beer are not factors that lead young San Diego drinkers to consume more craft beer compared to total beer, spend more on craft compared to total beer, or spend more on craft beer than domestic beer. For many years, the craft beer industry was just a very small collection of brewpubs and microbreweries spread throughout the country, who posed little to no threat to the large macro breweries who dominate the beer market. Those days are over, now the industry brings in an estimated $4.2 billion in revenues. In the past few years the craft beer industry has become one of the most popular and fastest growing alcoholic beverage segments in America. The craft beer industry recorded revenues of $3.9 billion in 2013 and an annual growth of 17.2% by volume (Kaczanowska). Craft beer has also realized annualized growth of 19% in the past five years. Beer consumers are increasingly demanding a greater variety of beers, and craft beer producers are capturing these consumers with the varieties they’re offering such as pale ales, stouts, bocks, porters, and all types of seasonal beers. The craft beer industry is in the growth stage and shows little to no signs of slowing down in the near future. The craft beer industry is projected to grow an additional 16.8% through 2014 (Kaczanowska). The industry is also projected to keep growing in the coming years, IBIS World projects annualized growth of 7.4% to reach $5.6 billion in 2018 and $6 billion before by 2020. The Brewers Association also set out an industry wide goal to achieve 20% market share by 2020. The number of breweries is also growing, currently there are around 2,619 craft beer producers, and IBIS World predicts that number to grow to around 3,464 by 2019. The industry is becoming so large and successful that it has become a legitimate alternative to the massively large American macro breweries, such as Anheuser-Busch InBev and MillerCoors, which have controlled the market for many years (NPR). The legitimacy of craft beer is further illustrated by the fact that although the beer market as a whole has been shrinking in recent years, the craft beer industry has shown continual growth (State of the Craft). Jennifer Zegler, a Mintel beverage analyst said: Unlike its domestic and imported counterparts, craft beer has been able to defy overall beer market trends and continue expansion during the economic downturn and subsequent slow recovery. Specifically, the large macro breweries “premium” and “sub-premium” brands have been in decline, while craft beer and the macro breweries’ “super-premium” brands have been consistently growing. Craft beer is seen as an affordable luxury for many consumers (White-Sax). Furthermore, the large American macro breweries have recently began producing what many in the industry would call “fake” craft beers or “crafty” beers. These copycat beers are made to look like craft beers, but according to The Brewers Association, are not technically craft beers. Two examples are AB InBev’s Shock Top, and MillerCoors’ Blue Moon beers. On top of the large breweries trying to produce beers that look like craft beers, they have also been acquiring independent craft breweries in recent years. For example, in 2011, AB InBev purchased the long-time independent craft brewery Goose Island. These are growing attempts by the large brands to capture the growing craft beer sales (NPR Staff). The U.S. craft beer industry is large and fast-growing, a major factor in that size and growth is the state of California and the 381 craft breweries it is home to. California ranks first in number of craft breweries as well as first in economic impact and number of barrels produced, with 2,948,895 barrels (32 gallons per barrel) produced in 2013. In California, the craft beer industry grew by 20% in volume in 2012 (California Craft Beer Statistics). California is home to 3 of the top 10 craft breweries as well as 12 of the top 50, 3 of which are located in San Diego County (Brewers Association). The location of a brewery is extremely important, according to Bart Watson, staff economist at The Brewers Association, “Consumers are excited about local products.” Furthermore, Mintel research found that 50% of craft beer drinkers express interest in local beer and suggest that more retailers include more local varieties into their product mix. Alisa Joseph of Scarborough U.S.A. points out the trend of localism by stating “…marketing to craft drinkers in their own communities can help a brand capitalize on the loyalty that comes with rooting for the home team…” (Craft Beer Sales Surge). According to the Brewers Association, between 2011 and 2013 nearly 80% of the growth in craft beer was attributed to new craft beer drinkers, the majority of which were between 21 and 29 years old. These consumers are Millennials, which Pew Research Center classifies as those born between 1980 and 1995. Millennials make up around 25% of the U.S. population and are estimated to have over a trillion dollars in direct buying power. Millennials are projected to be around 36% of the US population by 2020 (The Demographics of Craft Beer Lovers). A study from Mintel research found that 49% of Millennials say that they drink craft beers and another study from Scarborough U.S.A. found that 25% of all craft beer drinkers are between 30 and 39 years old and 50% of craft beer drinkers have a college degree or higher (Euromonitor). Young drinkers (ages 21 to 24) are expected to increasingly experiment with and seek out unusual beer, according to IBIS World. IBIS World also suggests younger people are a lot more likely to drink beer than those older than 50, who are spending their money on other types of beverages (Giraaldo). The largest growth segment for beer in the past five years has been drinking age millennials, and during the next five years the younger demographic will continue to be the main growth segment (The Demographics of Craft Beer Lovers). Millennials are adventurous, experimental, and like to be different than the generations before them, who drink beers predominately from macro breweries. Millennials also have a strong sense of individuality and personal identity. For these reasons Millennials and craft beer go hand in hand (Euromonitor). My research will focus on college age, primarily 21-23 years old, craft beer drinkers in San Diego County. 21 to 23 year olds are the youngest of the Millennials who are of drinking age, they are also a market segment that are on their way towards becoming economically stable and will soon hold significant buying power (Euromonitor). I will examine consumer knowledge, awareness, and drinking motivations along with basic demographics to get an idea of what makes a craft beer drinker more likely to consume more and spend more on craft beer as a percentage of total beer consumed. I was interested in analyzing a Share of Wallet type measurement for consumption as well as spending for craft beer as they relates to total beer consumption and spending. Share of Wallet is the percentage of money spent by a customer in a given category that goes to a certain company (Keningham). For the purposes of my study the Share of Wallet will be percentage of money a customer spends in the beer category that goes towards craft beer, as well as their percentage of beer consumed that is craft beer. To do so I used a respondents average weekly consumption of craft beer divided by their average weekly total beer consumption, as well as their average weekly craft beer spending divided by their average weekly total beer spending. I was also interested in the differences respondents were willing to pay between craft beer and domestic beer. Together, the three models I created will give insights into what influences young San Diego craft beer consumers’ consumption and spending habits in relation to domestic beer. The three variables mentioned above are the dependent variables I used in my analysis, and below are the conceptual frameworks I used for each linear model. The models used 8 independent variables that could possibly effect a craft beer drinker’s consumption and spending habits of craft beer as they relate to their total beer consumption and spending. I analyze two types of craft beer knowledge in my linear regression models, subjective knowledge (what someone thinks they know) and objective knowledge (what someone actually knows). I believe that both knowledge types will act positively on the dependent variables. My first hypothesis (H1a) is that there is positive relationship between objective knowledge and the percentage of beer money that is spent on craft beer. I believe that if someone has knowledge of craft beer they will get a higher sense of accomplishment by drinking craft beers and therefore buy a higher percentage of it compared to other beer. I also feel that if someone knows about craft beer they will know that craft beer usually has higher quality ingredients and more variety than other beers and will be willing to spend more of their beer money on craft beer than other beers. Hypothesis H1b is that subjective knowledge positively effects the percentage of beer money that is spent on craft beer. The reason being is that when someone feels they are knowledgeable about craft beer they will likely feel the need to purchase more craft beer as a way to display their knowledge. In addition, someone with low subjective knowledge may feel overwhelmed or intimidated by the craft beer culture and not want to purchase craft beers. The next hypothesis (H1c) is that objective knowledge will positively influence the percentage of beer consumed that is craft beer, I believe that if someone knows about craft beer they are likely to know when and where to buy certain craft beers and they are likely to purchase more often. Next is H1d there will be a positive relationship between subjective knowledge and craft beer. If someone thinks they know about craft beer they might think they also have to purchase craft beer to display their knowledge and also may think that buying craft beer is a better option than other beers. The next hypotheses deal with the way objective (H1e) and subjective (H1f) knowledge effect the price premium someone is willing to pay between craft beer and domestic beer, both of which are positive. When a consumer is knowledgeable of craft beer, they will know the differences between craft and domestic beer and will likely be willing to pay for it. If a consumer thinks they don’t know about the difference they might not know the difference in quality and will likely not be willing to pay a premium for craft beer. H1a: There is a positive relationship between objective knowledge and Percentage of Beer Money that is spent on Craft Beer. H1b: There is a positive relationship between subjective knowledge and Percentage of Beer Money that is spent on Craft Beer. H1c: There is a positive relationship between objective knowledge and Percentage of Beer Consumed that is Craft Beer. H1d: There is a positive relationship between subjective knowledge and Percentage of Beer Consumed that is Craft Beer. H1e: There is a positive relationship between objective knowledge and Price Premium between Craft Beer and Domestic Beer. H1f: There is a positive relationship between subjective knowledge and Price Premium between Craft Beer and Domestic Beer. My theory behind including awareness level into the linear regression models is that when a consumer is familiar with a product (or brewery) the consumer is likely to have that brewery in mind when making purchases in that category. I believe that having when a consumer is aware of craft breweries and has them in their consideration set while purchasing they are more likely to spend a higher percentage of their beer money on craft (H2a) and therefore also consumer a higher percentage (H2b). I also believe that when a consumer is aware of many craft breweries, they will be willing to pay more for craft beer than domestic beer (H2c) because they will likely have seen that craft beers are usually at a higher price point than domestic beer and therefore willing to pay the extra money for them. H2a: There is a positive relationship between awareness level and Percentage of Beer Money that is spent on Craft Beer. H2b: There is a positive relationship between awareness level and Percentage of Beer Consumed that is Craft Beer. H2c: There is a positive relationship between awareness level and Price Premium between Craft Beer and Domestic Beer. The underlying motivation of why someone is drinking alcohol changes their spending and consumption habits of alcohol, for that reason I chose to include drinking motivations in my linear regression models. I believe that if a craft beer consumer is drinking for the craftsmanship aspect, the culture aspect, or if they have a strong preference for craft beer they are likely to spend more on it and consume more of it. When someone is interested in how a beer is made they will likely get more joy from consuming that beer, also if someone is interested in the culture or has a preference for craft beer they are likely to spend the money to consume more craft beer. I also included alcohol as a drinking motivation as a drinking motivation into my models, but I believe that if someone drinks for the alcohol aspect of beer they are likely to have a smaller portion of their beer consumption and spending be craft beer and also may not be willing to pay a premium for craft beer. I believe that someone drinking to get drunk will likely choose cheaper domestic beers because they can get more alcohol for their money. A consumer drinking just to get drunk is also not likely to appreciate the variety of tastes that craft beer offers and therefore will not be willing to pay extra for it. H3a: There is a positive relationship between Craftsmanship Score and Percentage of Beer Money that is spent on Craft Beer. H3b: There is a positive relationship between Culture Score and Percentage of Beer Money that is spent on Craft Beer. H3c: There is a negative relationship between Alcohol Score and Percentage of Beer Money that is spent on Craft Beer. H3d: There is a positive relationship between “Craft Is King” Score and Percentage of Beer Money that is spent on Craft Beer. H3e: There is a positive relationship between Craftsmanship Score and Percentage of Beer Consumed that is Craft Beer. H3f: There is a positive relationship between Culture Score and Percentage of Beer Consumed that is Craft Beer. H3g: There is a negative relationship between Alcohol Score and Percentage of Beer Consumed that is Craft Beer. H3h: There is a positive relationship between “Craft Is King” Score and Percentage of Beer Consumed that is Craft Beer. H3k: There is a positive relationship between Culture Score and Price Premium between Craft Beer and Domestic Beer. H3m: There is a negative relationship between Alcohol Score and Price Premium between Craft Beer and Domestic Beer. H3n: There is a positive relationship between “Craft Is King” Score and Price Premium between Craft Beer and Domestic Beer. I chose to include level of tourism of a consumer into the linear regression models because I believe that a consumer that is more involved with the craft beer industry and contributes to the craft beer culture by going to craft beer events and participating in craft beer activities will also be willing to contribute their money to craft beer by purchasing and consuming craft beer. H4a: There is a positive relationship between Tourism Activity Participation Percentage and Percentage of Beer Money that is spent on Craft Beer. H4b: There is a positive relationship between Tourism Activity Participation Percentage and Percentage of Beer Consumed that is Craft Beer. H4c: There is a positive relationship between Tourism Activity Participation Percentage and Price Premium between Craft Beer and Domestic Beer. This paper uses data gathered from a survey conducted by marketing students at San Diego State University during the spring 2014 Semester. The survey was originally meant to be a class project for Dr. Andrew Baker’s Marketing 470 (Marketing Research) course, in which groups of students (myself included) would learn to design a survey, collect data, and finally analyze small portions of the data. The survey was focused on craft beer, and each group had different goals in mind when contributing to the survey. The classes combined efforts resulted in a fairly large survey which examined craft beer knowledge (objective and subjective), awareness of craft breweries, craft beer preferences, craft beer spending and consumption habits, motivations and attitudes towards craft beer, beer style preferences, and basic demographics. A convenience sampling method was used in which students asked friends and family members and acquaintances to take the survey, which ultimately yielded 1,392 valid responses after removing bad data. Respondents were excluded if they spent 6 or fewer minutes on survey (data exploration and testing suggests very low engagement in study), respondent straight-lined all beer preference questions, or respondent claimed to be familiar with all breweries in survey, including the 2 fake ones. The data gathered is not a representative sample of craft beer drinkers, young people, or San Diego locals (live, work, or go to school in San Diego) but the way the sampling was conducted, the respondents predominately have the three characteristics mentioned. This measure is the combination of two variables from the survey. Respondents were asked their average weekly craft beer spending as well as their average weekly total beer spending. I simply divided average weekly beer spending by average weekly craft beer spending to get the respondents percent of total beer money that is spent on craft beer. The average percent of beer money that is spent on craft beer for the sample was 83%. Similar to the previous measure, this measurement is the combination of average weekly beer consumption (in number of beers) and average weekly craft beers consumed (also in number of beers). The average percent of beer consumed that is craft beer was 64% for the sample I analyzed. To measure the price difference someone is willing to pay between craft beer and domestic beer, I used two questions on the survey and subtracted the two answers to get the difference. Imagine you were looking to purchase a 6-pack of beers for either yourself or for your beer drinking friends. While at the store, you see these two 6-packs available for purchase. What is the maximum price you would be willing to pay for each 6-pack while still considering the purchase to be a good value for the money? Then the respondent was shown both a 6-pack of Bud Light as well as 6-Pack of Stone Levitation Ale (random order by respondent). For each picture the respondent was to pick the price they were willing to pay from a drop down menu. The exact layout of the questions can be seen in the appendix. 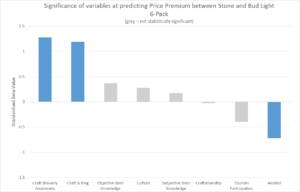 The average price premium respondents were willing to pay for the Stone 6-Pack over the Bud Light 6-Pack was $3.58 with a Standard Deviation of $2.37. One of the statements was scored reversed (I really don’t understand much about craft beer) and was also used as a method to weed out bad respondents who may have been “straight lining” the survey. The results were coded 1-5, 1 being Strongly Disagree and 5 being Strongly Agree. The subjective knowledge score for each respondent is the average of their 6 responses. The average scores for Models 1, 2, and 3 were 3.14, 3.35, and 3.09, respectively. To measure objective knowledge, respondents had to opt in to a series of 4 questions following the above mentioned subjective knowledge questions. After agreeing to answer the 4 short questions, the subjects were given 3 multiple choice and 1 true/false dealing with the brewing process of craft beers. What are the traditional four main ingredients in beer? True or False: Lagers are normally fermented at higher temperatures than ales. What does “dry hopping” mean? What does IBU stand for? The objective knowledge score for each respondent was the number of correct answers they had chosen, 0-4 possible. The average score for Model 1 was 1.56, the average for Model 2 was 1.67, and the average for Model 3 was 1.53. For uses in my research I only focused on whether or not the respondent was familiar with the craft breweries. I divided the number of craft breweries the respondent said they were aware of by 16. The percentage received for each respondent is what I used as their “Awareness of Craft Breweries.” The average awareness level of the sample analyzed in Model 1 was 61%, the average for Model 2 was 66%, and the average for the sample analyzed in Model 3 was 60%. For my purposes I coded “I have done this” as 1 and all other responses as Zero. My reasoning behind this is that someone’s intentions of doing something are weakly correlated with them actually following through and intentions data often contain systematic biases; intentions change over time and may not accurately predict actual purchases (Sun). Therefore, for the intentions of my survey, someone responding that they may like to do a certain activity can be counted as them not participating in that activity. I then added the number of activities a responded had done in the last six months and divided by 7 to get the “Tourism Activity Participation” for each respondent. The level of tourism participation was very low for the samples I analyzed, the averages were 24% (Model 1), 26% (Model 2), and 23% (Model3). There was a 20 question portion of the survey that was designed to examine the survey respondent’s motivations towards craft beer. For my research purposes I combined some of the 20 Likert scale questions in order to come up with 4 drinking profiles which I, alongside Dr. Andrew Baker, have named “Craftsmanship” Drinker, “Culture” Drinker, “Alcohol” Drinker, “Craft is King” Drinker. The “Craftsmanship” profile is the combination of three questions about the excitement and process of craft beer production and consumption. The averages for the craftsmanship as a drinking motivation score were 3.88 (Model 1), 4.01 (Model 2), and 3.87 (Model 3). The “Culture” profile if the combination of four questions in relation to the social and cultural elements of craft beer. The averages for culture as a drinking motivation score were 3.86 (Model 1), 3.98 (Model 2), and 3.83 (Model 3). The Alcohol as a drinking motivation profile is the combination of four questions about the alcohol aspect of beer, in which a higher score indicates a higher preference for the alcohol content of beer. The averages for alcohol as a drinking motivation score were 2.42 (Model 1), 2.41 (Model 2), and 2.43 (Model 3).The “Craft is King” profile is a combination of questions that indicate a strong preference of craft beer. The averages for the “Craft is King” drinking motivation score were 3.78 (Model 1), 3.91 (Model 2), and 3.76 (Model 3).Each respondent is scored for each of the four profiles from 1 to 5 (1 being low and 5 being high), the scores are an average of what the respondent on the Likert scale questions in relation to each drinking profile. I used a Univariate Linear Regression model to test my research hypotheses. In my results I include the three models I created along with their reported coefficients (β), and significance levels (Sig.) All three models include the same 8 independent variables (subjective knowledge, objective knowledge, awareness, tourism, craftsmanship, culture, alcohol, and “craft is king”) as well as basic demographic variables (Gender, Age Group, Ethnicity/Race, Monthly Household Income, and whether they were a San Diego Local or not) acquired from the craft beer survey. The R2 (and Adjusted R2) for the three models were as follows; Model 1 = .166 (.145), Model 2 = .355 (.315), and Model 3 = .255 (.238). In Tables 1 through 6 you will see the summary statistics of all variables used. On average the sample population was willing to pay $3.57 more for a 6-Pack of Stone Brewery Beers than they were for a 6-Pack of Bud Light. On average the sample population spent 83% of their average weekly total beer money on craft beer. On average the sample population’s weekly average craft beer consumption was 63.5% of their average weekly total beer consumption. The sample showed higher subjective knowledge than objective knowledge, with averages being 3.14 out of 5 (Model 1), 3.35 out of 5 (Model 2), and 3.08 out of 5 (Model 3) for subjective knowledge and 1.56 out of 4 (Model 1), 1.67 out of 4 (Model 2), and 1.53 out of 4 (Model 3). Craft brewery awareness was not very high for the sample with the average being 61% awareness for the 16 given breweries for Model 1, 65.8% for Model 2 and 60% for Model 3. Tourism participation was very low for the sample population, the average was 24%, 26%, and 22.7% activity participation of the 7 tourist activities listed for models 1, 2, and 3, respectively. The results from each of the three regression models can be seen in Table 7. I ran a regression for each of my dependent variables, using 8 independent variables, while controlling for other covariates. Percentage of average weekly total beer money that is spent on craft beer model. 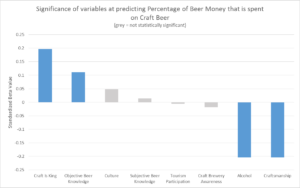 I found that objective knowledge has a positive effect on the percentage of beer money that is spent on craft beer (p = .012). 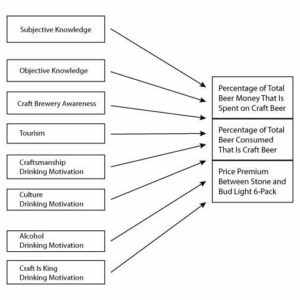 Objective knowledge is expected to raise the percentage of beer money spent on craft beer by 2.5% for each additional objective knowledge question answered correctly. This finding supports H1a. The “Craft Is King” variable also has a significant positive effect on the percentage of average weekly beer money is spent on craft beer (p = .001). This finding supports H3d. Specifically the results of the model show that the percentage of beer money allotted to craft beer is expected to rise by 6.4% for each additional rating a respondent is on the “Craft Is King” Scale (1-5), where a higher rating translates to a higher preference for craft beer. The rating scale for how much a respondent values the craftsmanship of craft beer has a significant negative effect on the percentage of average weekly beer spending that is spent on craft beer (p < .001) This finding does not support H3a. The results indicate that when someone values the craftsmanship aspect of craft beer (rated on a scale of 1-5), for each additional point they are rated in their craftsmanship drinking motivation their percentage of beer money that is spent on craft beer goes down 6.8%. I found this to be a very surprising finding, and could have a number of explanations. One theory I have is that someone who is very interested in the craftsmanship may be brewing their own beer (or know someone who brews beer) and therefore not spending as much on craft beer. Another explanation may be that someone who appreciates the craftsmanship of craft beer may not also be interested in the taste and/or may not be willing to spend the money on craft beer. The only other independent variable to have a significant influence on the dependent variable was alcohol as a drinking motivation, which had a negative influence (p < .001). The findings support H3c. The alcohol as a drinking motivation scale findings suggest that for each additional point on the drinking motivation scale, the percentage of beer money that is spent on craft beer is predicted to drop by 8.1%. Subjective knowledge and craft culture as a drinking motivation both had a positive influence on the dependent variable but the relationships were not statistically significant (p = .816) and (p = .399), respectively which does not support H1b or H3b. Craft brewery awareness seemed to have a negative influence on the percentage of beer money that is spent on craft beer but the effect was not significant (p = .735) which does not support H2a. H4a was also not supported by the regression findings, tourism participation had a negative effect on the dependent variable and (p = .911). Below are charts of the Standardized Beta figures for the models (Figures 2, 3, and 4). The Standardized Beta standardizes the beta coefficients used in the model so that even if they are scaled differently they can be compared easily. The larger the bars in the chart are, the more influence that variable has on the dependent variable and the color of the bar indicates whether or not that variables influence was statistically significant. Percentage of weekly beer consumed that is craft beer model. The next model I ran was to predict how much of a consumers total beer consumption will consist of craft beer. As with the last model the “Craft Is King” drinking motivation had a significant positive influence on the dependent variable (p < .001) which supports H3h. One unit increase in the “Craft Is King” drinking motivation score is expected to yield an 11.1% increase in the percentage of weekly beer consumed that is craft beer. This model also supports H3g, that the Alcohol as drinking motivation variable will have a negative influence on the dependent variable (p < .001). For every unit increase (1-5) someone is rated as having alcohol as a drinking motivation, their percentage of beer consumed that is craft beer is expected to drop by 8.5%. Craftsmanship as a drinking motivation, showed a negative influence on percentage of beer consumed that is craft beer according to the model (p .012) which does not support H3e. For each additional rating someone is given in their likeliness to value the craftsmanship in craft beer, their percentage of total beer consumed that is craft beer is expected to fall by 6.2%. The two independent variables in this model that were found to have significant positive effects on percentage of beer consumed that is craft beer were subjective knowledge (p = .011) and awareness of breweries (p = .001), which supports H1d as well as H2b. One unit increase in subjective knowledge score is expected to raise craft beer consumption as a percentage of total beer consumption by 5.5%. Tourism again did have a negative effect on the dependent variable but the results were not statistically significant (p = .858) which did not support H4b. Both objective knowledge and culture as a drinking motivation did have a positive influence on craft beer consumption as a percentage of total beer consumption but the results were not statistically significant. The results did not support H1c or H3f. Price premium between Stone and Bud Light model. In this model, awareness of breweries had the most profound effect on the dependent variable. Awareness of breweries had a positive influence on the price premium someone is willing to pay between a Stone 6-Pack and a Bud Light 6-Pack (p < .001), this result supports H2c. The results of the model suggest that someone who is aware of all 16 breweries that were listed on the survey is expected to pay $1.97 more than someone who is not aware of any of the breweries. As with the other models the “Craft Is King” drinking motivation had a significant positive influence on the dependent variable (p < .001) which supports H3n. Specifically for every unit increase someone receives in their “Craft Is King” drinking motivation score, the price difference they are willing to pay should increase by $0.56. The Alcohol as a drinking motivation had a significant negative influence on price premium between a Stone 6-Pack and Bud Light 6-Pack (p = .001) which supports H3m. For every unit increase someone is given in their alcohol as a drinking motivation, they are expected to pay $0.42 less for a Stone than Bud Light 6-Pack. While “Craft is King” and alcohol as a drinking motivation are the only two variables that are statistically significant in all three models, their level of influence changes throughout the three models. Two variables that have non-statistically significant influences in all three models are culture as a drinking motivation and tourism. It is also interesting that awareness has a statistically significant positive influence in Models 2 and 3 and a negative, but non-significant influence in Model 1. Variable Coef. β Sig. Coef. β Sig. Coef. β Sig. The three models I created set out to predict three things that are very complex in the real world. While my models do not decisively say that each of the predictors will influence craft beer consumer behavior in real world settings, they do bring up some interesting ideas for beer marketers. My first two models (Craft Beer spending as a percentage of Total Beer spending, and Craft Beer consumption as percentage of Total Beer spending) have to do with ratios and not actual money spent or beers drunk. Therefore the implications may be important for craft brewers that want to gain market share in “big beer,” but may also be useful for large macro brewers that want to see how or why craft beer is gaining on them. I will focus on implications for craft beer marketers. The first model, which is a Share of Wallet type prediction to see what influences a consumers craft beer spending as a percentage of total beer spending had 4 statistically significant predictors. 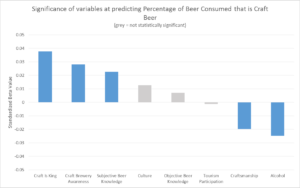 Objective knowledge had the least impact of the 4 but is still interesting for marketing purposes, educating consumers on the brewing process may lead to a consumer spending more on craft beer than they do other beers. A craft beer company may offer classes and workshops to educate consumers to capitalize on this. The next significant variable, may be a somewhat obvious one since it is the drinking motivation “Craft is King” which deals with consumers that have a high preference for craft beer. The interesting finding however, is that this variable did not have the largest impact on “share of wallet.” While objective knowledge has a positive impact and a high preference for craft beer has a positive influence, both preference for alcohol and craftsmanship of beer as drinking motivations negatively impact “share of wallet.” My model suggests that the high alcohol content that many people associate with craft beer may not necessarily translate into gaining “share of wallet” in the beer category for consumers. While individual craft breweries are far from competing with major macro breweries in terms of volume, the collective craft beer industry is poising a serious threat to “big beer.” My second model, percentage of average weekly beer consumed that is craft beer, had 5 statistically significant predictors. Subjective knowledge seemed to have the smallest positive impact according to the model, but the influence was statistically significant. I think craft beer marketers could capitalize on this influence by convincing consumers they are knowledgeable about beer while they may not necessarily be. For example a craft beer company could use copy in their advertisements that hints at the fact that educated or sophisticated drinkers drink their beer. Craftsmanship and alcohol as drinking motivations, as with the last model has a negative influence in the craft beer as a percentage of total beer model. For craft beer marketers this is very important if their goal is to take away from large macro breweries. Many craft breweries emphasize the craftsmanship and artistry that goes into their brewing process but my findings suggest that this may not be important in the eyes of young craft beer drinkers. The same can be said when it comes to the alcohol content in craft beer. As expected in this model, the drinking motivation “Craft is King” has a positive influence on the percentage of beer someone consumes that is craft beer. It may also be obvious that craft beer marketers should focus heavily on those that already are drinking craft beer and get them to purchase more. Awareness has a huge positive impact according to my model. The implications of this are that craft breweries should invest in raising awareness for the industry as a whole, which brings up the issue again that single breweries alone cannot yet compete with large macro breweries but the industry can. Craft beer marketers should likely be more willing to invest and participate in collaboration beers, craft beer festivals, and to a certain extent the promotion of competing beers according to my findings. The final model, which predicts the price difference someone is willing to pay between craft beer and domestic beer had three statistically significant predictors. The predictor with the smallest impact was alcohol as a drinking motivation and influenced price premium negatively. Craft beer marketers may not want to focus on beer drinkers who do not value taste but instead highly value the alcohol aspects of beer. This model, as with the others suggested that a high preference for craft beer (“Craft is King” drinking motivation) will increase the price premium. So a craft brewery will find it useful to emphasize the fact that their beers are craft beers when competing with macro breweries. The big influencer in this model was awareness which is very significant for all craft breweries. My findings suggest that drinkers who are familiar with the industry and other craft breweries will be willing to pay far more for craft beer compared to domestic macro brewery beer. It may be beneficial for craft breweries to work alongside each other even while they are competing in order to compete against their collective threat, large macro breweries. There were a few limitations to my research, for one, the survey used was not made with my research goals in mind. The survey was a combined effort of many students who all had different goals they wanted to achieve with the collected data. So, some information regarding the ways consumers feel about craft beer compared to domestic beer and also specific questions regarding Share of Wallet for specific breweries are missing. Specifically, a question on how much someone spends at specific breweries or how much beer the respondent is consuming from a specific brewery could have yielded more company specific Share of Wallet measurements. Furthermore, the data was collected using convenience sampling, in which students, such as myself, asked friends and family members to complete the survey. The sampling method resulted in a sample population that is not a reflection of the actual drinking population. Another limitation was the measurement I used as the price premium someone is willing to pay between craft beer and domestic beer was based off one very short section of the survey. The survey only asked one question regarding this issue (using 2 different beer) and the results may reflect the way consumers feel about those specific beers and not how they feel about craft beer or domestic beer in general. Giraaldo, Vanessa. (Jun. 2014). Breweries in the US. IBIS World Industry Report 31212. Retrieved from IBIS World database. Kaczanowska, Agata. (Aug. 2013). Craft Beer Production. IBIS World Industry Report OD4302. Retrieved from IBIS World database. Sun, Baohong & Morowitz, Vicki. (2010). Stated Intentions and Purchase Behavior: A Unified Model. International Journal of Research in Marketing. Vol 27(Issue 4). December 2010. 356-366.